Wet rooms used to be something that only the wealthy could install in their expensive homes. In the last decade, however, they’ve become affordable to the masses, their demand has gone up and most people are now aware of the benefits of a wet room over a standard shower room or bathroom. 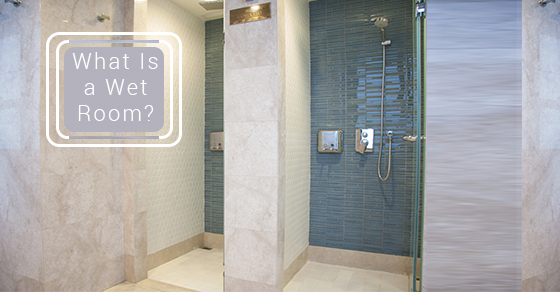 So what’s the difference between a shower room and wet room? If you looked at your current shower room, you would realise that some parts are waterproof while others aren’t. Traditionally, the areas around the bath or shower would be tiled to keep the water out of the walls while the floor and some other areas were not waterproof. A wet room, on the other hand, is like a waterproof box; the entire room, including the floor and zones away from the shower, is treated and tiled, preventing dampness from reaching other parts of the house. A wet room will certainly drag your house well and truly into the 21st century with a modern contemporary look, but still there are a number of other reasons why your house should have a wet room. Firstly, a wet room is by far more spacious than a bathroom, which makes showering in these cubicles a whole lot more appealing experience. Also, you don’t need to worry about water reaching the walls or other adjacent rooms because the wet room is completely waterproof. For the elderly and people with disabilities, wet rooms may be more practical than bathrooms or shower rooms as they are all on one level, making access with a wheel chair possible. No climbing is needed, either. On the flipside, wet rooms may not be ideal for families with young children. If you’ve installed tile floors, they may be a little bit too dangerous for children under 7 as slips and falls are likely to increase in people who have yet to develop full balance. However, this can be avoided by placing slip guards on the floor. Finally, if you want to install a wet room in a small bathroom, the spray from the shower might have an impact on your toilet rolls and bath towels, which is why you may want you to install a shower screen. If you really want a new wet room, and one that perfectly matches your specifications, you may need to design your space from scratch, giving you choice over everything, from the layout to the tile finish. If your bathroom is a small one, take the bath out completely and transform it into a wet room without a shower cubicle to make the room feel bigger! For more information on how you can start your wet room upgrade, contact our team today!